When I arrive for a warranty inspection on newly constructed homes, the homeowner often has a list of issues waiting for me. (30 day or 1-year inspections). These disappointments may not even make it on to my list of defects if they are not covered by warranty. Some of these may be avoidable by working closely with the builder during the buying process. Basement height or layout: In this world of 9 and 10-foot ceilings, be prepared for a shock when you enter the basement. 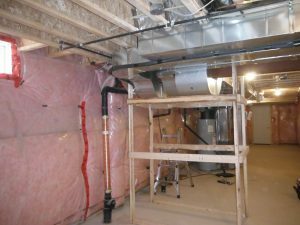 The minimum code height is not impressive, and basement space and head clearance can be reduced by ductwork, unexpected placement of columns and large areas of lowered floors. Don’t expect common sense to come in to play in the arrangement of ductwork or positioning of the furnace and water heater, it will be installed in the cheapest arrangement possible. If you specified an increased height of basement, and paid more for it, beware of the use of “approximate” height in your contract. Does 10 inches less than what you asked for meet the requirement of “approximate” height? Garage stair arrangements or lack of garage entrance door: The common story is that the builder will not commit to position of garage man-door stairs, or even location of the garage man-door because they don’t know what the final grade of the garage floor slab will be. If parking your car in the garage is one of your objectives, you need to work closely with the builder on this one or you may find your parking spot has been taken up by stairs and landing. Awkward arrangements of shower doors or other bathroom fixtures: Fixtures on the wrong side of the soaker tub, shower doors that collide with toilets, showers where you must get soaking wet to turn them on. No more needs to be said except that none of this will be covered by warranty unless it is contrary to original specifications. Basement floor slab cracks: Poor quality basement floor slabs are the new norm. It’s not true that all concrete must crack, but it is true that all poor-quality concrete work will crack. The lowly basement floor is not a structural component, so it is permitted (by warranty terms) to crack and heave or sink within limits. If cracks are beyond 4mm wide, or the overall slope towards the floor drain is significantly impacted, or there is significant displacement of the broken sections, it may be covered by warranty. It is an unlikely scenario that a homeowner can convince a builder to redo a basement floor. Gaps at interior window frames and casings: Most people don’t like to see gaps between components on interior finishing. Winter condensation often brings attention to the window frame areas, and wood shrinkage or warping can increase gaps around window casings and trim. If the air barrier and vapour barrier work has been correctly done within the walls, then these gaps do not represent an air leakage risk. My recommendation is to NOT add caulking at these gaps, because the caulking is more likely to encourage mould growth in the future, especially as condensation on windows is common in these new houses.